Electric blue roads twist and turn, offering an escape from the gaudy chaos of flying beasts and bug-eyed monsters running rampant over a city enveloped in flames. Where do those roads lead? No one knows exactly. But that’s the best part of the journey. In a vibrant burst of rainbow colors, this scene plays out on the exterior of the ‘79 Volkswagen T2 Transporter that Aaron Neilson-Belman, a freelance web developer and photographer from Canada, has transformed into the ultimate hippie mobile with the help of Toronto-based graffiti artist Alex Currie. Reminiscent of the psychedelic, Day-Glo bus that took Ken Kesey and his Merry Prankster’s “furthur” and “furthur” from San Francisco to New York in 1964 and down through Mexico while Kesey dodged drug charges in 1966, Neilson-Belman’s van will be turning heads the same way the Pranksters did during a year-long trip from Canada to South America for a project he calls the Hippie Man Van. Neilson-Belman is one of a growing number of travelers who are tapping into a nostalgia for hippie era adventures, a trend that’s being exploited by the descendants of the original Pranksters with the upcoming restoration of the Furthur bus. But today, you don’t necessarily need a bus or a van of your own. Now, budget travel options are making it much easier for travelers of all ages to see the world and capture the free spirit of the pioneer hippies who set out in search of themselves, finding more than they ever bargained for in the culture and history of faraway places. Rather than letting 9-5 jobs and a false conception of the “American dream” run their lives, the hippie counterculture proved that there is much more to explore beyond the four walls of your cubicle–you just have to be up for an adventure to find it. Chronicled most extensively in Tom Wolfe’s The Electric Kool-Aid Acid Test, Kesey and the Pranksters, who are widely accepted as the original hippies, gave a big middle finger to the conformist American society lingering on from the conservative ‘50s by heading out an acid-fueled adventure across the country with their stated destination simply being “furthur.” Painted across the front of the bus, this became the mantra for their trip and has remained the name of the iconic bus that the Kesey family is currently raising money to restore. Headed by Ken’s daughter-in-law, Stephanie Kesey, the restoration is the first project for the family’s Furthur Down the Road Foundation. 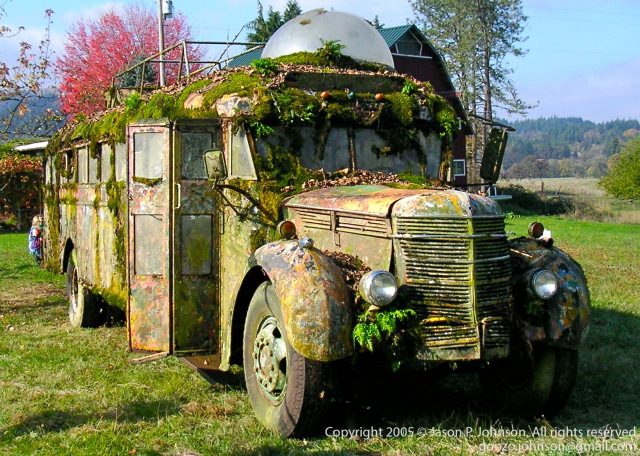 With the launch of their website, furthurdowntheroad.org, coming soon, the Kesey family and a group of original Pranksters hope to bring the spirit of the hippies back with an open forum for people to share their own experiences with the bus, as well as restoring the bus for many more adventures to come. Celebrating freedom of thought and expression, the Pranksters believed that the destination wasn’t just a physical place, but a state of truth that could only be reached through the expansion of one’s own perception of reality. Although psychedelic drugs also altered their reality, the Pranksters’ adventures on the road expanded their awareness of the world in a way they had never imagined. The act of travel itself seemed to have the power to expand their minds by introducing them along the way to different people and places. 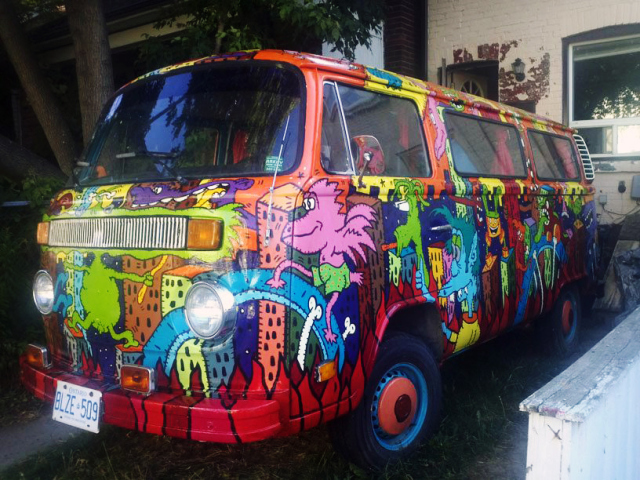 Taking a risk of his own, Neilson-Belman will embark on a yearlong journey in his own hippie mobile this August, starting in his hometown of Toronto and making his way all the way down through South America. Through various social media channels and his website, hippievanman.com, he hopes to inspire others to share his adventure and savor the freedom and focus on the here and now that the open road allows. So when he finally came across the classic VW van he had been dreaming about for years in the classified section on Craigslist a few years later, he knew it was something he couldn’t pass. “The price was right so I just said, ‘I’ve always dreamed of having one so why don’t I just do it now while I’m young?’” he said. Again looking to Craigslist, Neilson-Belman placed an ad in the ‘Creative Gigs’ section, asking for someone interested in doing a psychedelic mural on the van. When he heard back from Currie, a celebrated muralist who has been voted best graffiti artist by Now magazine on five separate occasions, Neilson-Belman knew he had found his man. He gave him free reign over the design, which turned out to be a combination of Currie’s uniquely crafted characters and winding blue roads to represent the road trips that the van would soon adventure on. Go with the flow. It’s all about existing in the moment and letting your circumstances determine your destination. You never know where it could lead you. But that’s not to say it’ll be easy. While the hippie van or bus may not be the most environmentally friendly mode of transportation, there are many other things you can do to help cut down on your carbon footprint while traveling. The hippies were all about preserving the environment. “I try to be especially conscious in underdeveloped countries and always try to have biodegradable soaps,” said Bramble. A lot of times the water I’m showering in will be the water that people in that country will end up drinking so I always try to be conscious of that.” She also recommends bringing your own refillable water bottle as it can often be difficult to find recycling options on the go and most plastic bottles end up in landfills. Eating locally will also help to cut down on pollution from imported goods. “Overall, it’s about doing what you can,” she said. Couchsurfing and AirBnB are great options for cheap accommodation, but what about transportation? In terms of booking flights, Bramble suggests checking out Momondo and Kayak to compare prices from a wide range of airlines. Orbitz and Skyscanner are among Neilson-Belman’s favorites. “It’s really about doing your research over and over again,” said Bramble. “You have to play around with different sites to figure out what’s cheapest.” This also works for train and bus travel. “The Euro-Rail is great when you’re in Europe because you can jump on their site and plug in different destinations to see what the cost difference will be,” explained Bramble. You can also take the Pranksters and Neilson-Belman’s approach of road tripping. He suggests packing in more people to help cut down on costs of gas and driving the speed limit to keep gas consumption in check.